For all the natural beauty and exotic locales you can expect to see in Australia, you should also be prepared to come across a fair share of creatures that will send a shiver down your spine and/or try to kill you. It's part of the reason you shouldn't keep your car doors open too long there, as one man learned this week when he found a koala inside his vehicle, cooling off in front of the air conditioning and refusing to leave. While checking on the fruit at his family's vineyard outside Adelaide on Monday, winemaker Tim Whitrow left his car running with the door open so that his dog could hop in and out of the air conditioning while he worked. His pet-friendly plan didn't quite pan out as intended, though, because when he returned to the car he discovered a koala had welcomed itself inside to relax and chill in the air conditioning, according to ABC News. As soon as he noticed what had happened, he took out his phone and filmed the whole scene. "This is what happens when you leave your car doors open in a vineyard... koalas jump into your car, and your dog's really curious," Whitrow narrates over the footage, as his dog looks on in amazement, inquisitively poking his nose in the koala's direction. The koala was in no rush to leave the comfort of the cool car and it took Whitrow quite a while to coax him back outside. He tried giving it some water, but instead it climbed into the front seats and firmly attached itself to the dashboard, scratching it up with its razor-sharp claws. After pleading with the little guy to leave, he finally managed to peel him off and push him out the passenger side door. It eventually scurried away and climbed up a nearby gum tree. 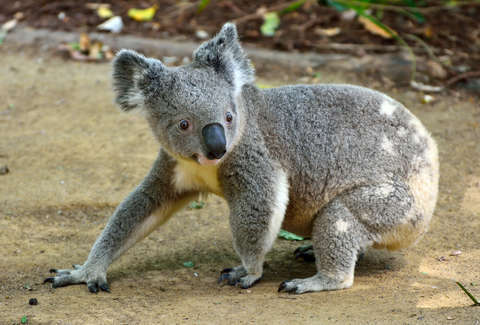 Although they may seem cute and cuddly, koalas can be quite violent, so Whitlow's lucky he made off without being bitten or scratched. Though frankly, we'd take an uninvited koala in the car over a monster spider any day.